This is our 2009 Diary, sent to friends and family at the end of the year for the Holiday Season, embellished more than a little. Happy Holidays everyone: it’s time for the annual update! 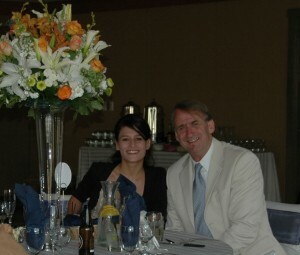 Janet (www.purelycaptivating.com) took this amazing photo at Laura and Damian’s wedding. She first took a couple of standard poses, and then had an inspiration and suggested that the children jump. No need to ask twice: look at them go!! Not one foot on the ground!! 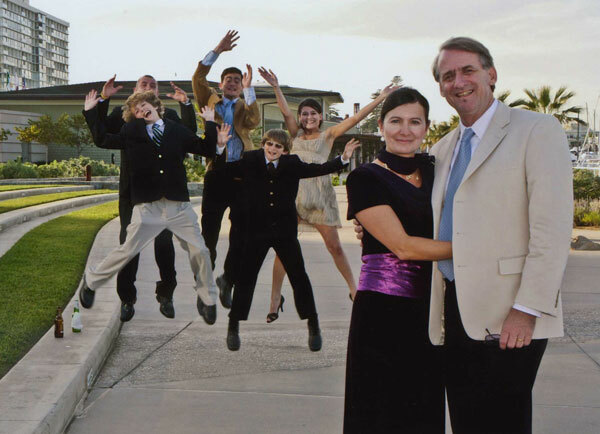 Alban later observed that the parents too should have jumped: hard to argue with that! 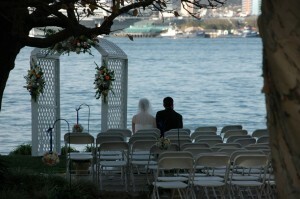 February brought our first great event of the year, Laura and Damian’s February wedding in San Diego. All of us were invited, which was really kind of Laura and her parents because there are so many of us. And we all made it to the wedding, except for Tom who (in Paris) was a bit too far away. Before the guests sat themselves down all around them, bride and groom sat quietly together looking out across the bay to San Diego: a touching moment. We had such a great time: thanks again, Nash family! Laura is my niece, my sister Sue and Derek’s daughter. Born in England, she was raised in California from the age of ten, educated here and settled here in San Diego, where she met and fell in love with Damian. As of this writing (end of the year), Laura and Damian are well on their way to Sue and Derek’s third grandchild (we’re jealous! ), following on from Courtney and Antony’s Dylan, born on May 22. Daphne and her step-dad, as she would say it, at the reception. Regretfully, that is not a soul patch on my chin. Please don’t ask! They decided on a February wedding, which would have made no sense at all except that they were in San Diego: the sun was out and warm and the scenery was almost as beautiful as the bride. Above is our favorite shot of the bride and groom. 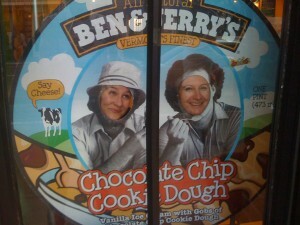 Their faces are unfortunately not visible (okay, okay, we know that this is a significant omission! ), but their sharing a quiet moment in the midst of all that hectic activity conveys a lot. We all stayed together on the island, and Antony helped us out by entertaining Daphné, Nick and Alban both evenings. We did ask what they had been doing with their cousin, but the response was far from clear! One of the February storms left this coating of hail on the deck, as seen from the French windows in the living room. Also in February, we had a couple of serious storms. Rain in Santa Cruz is relatively rare, and is rarely the grey drizzle that those of us raised in the UK and France grew up with. When it rains, as pessimists say, it pours! Or hails, as the case may be. Then starting in about April we had about four or five months with no rain to speak of. That’s nice too, especially for those of us raised in the UK and France. Plus, we rarely overheat on the Northern California coast, because of the fog. It comes and goes, mostly only present at night and early in the morning, but sometimes it won’t burn off until mid-afternoon, and more rarely it won’t burn off at all. As natural air conditioning it can’t be beat. 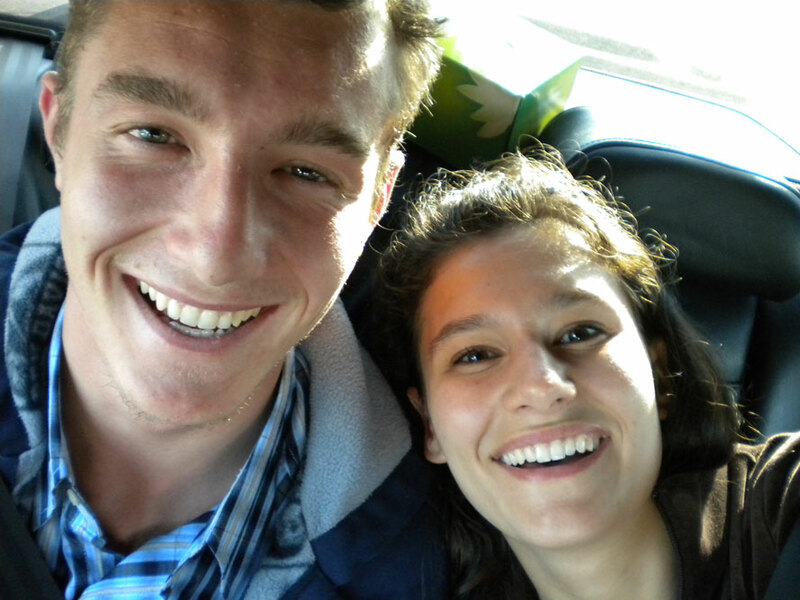 Daphné and Alban just after they arrived in Paris to visit their dad, having had almost no sleep in 30 hours, in the taxi on the way into town. Daphné and Alban went to Paris to visit their father and his side of the family during the month of August. Those visits have occurred on and off since we all moved to the US. The difference this time is that Daphné took a whole album of photos, and gave us copies. So this year we have a page of photos of Alban and Daphné’s summer vacation in France! Daphné and Marie-Hélène proving once again that they are seriously related! Daphné worked at Bubba Gump’s on Pier 39 in San Francisco for most of the year, until she left for Tahoe. This is between Pier 39 and Fisherman’s Wharf. 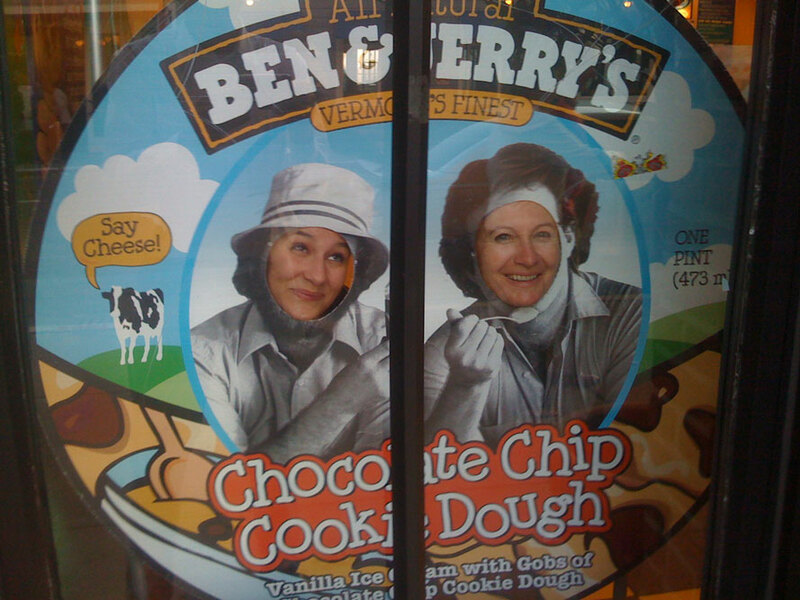 Some of us are serious fans of Ben and Jerry’s! Others are really missing something special! She announced during the fall that she was going to move to Tahoe for the ski season, and she’s already there! The first powder was in early December, she recounted gleefully, and there are already two foot of snow around the lake (which is at an elevation of over 6000 feet). In short, she got what she wanted, a skier’s paradise. She made contact with other young people planning on spending the winter season there, found and arranged to share a rental house with them, and even found a job waitressing, all before moving there! This is what being young is all about. We hope that it’s a great year for skiing, and needless to say we all are planning to visit! 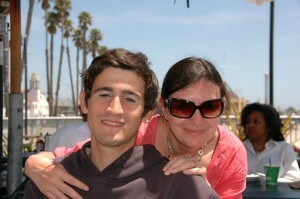 Nick and Marie-Hélène at the Ideal Cafe with the rest of us (except Tom, of course) for Mother’s Day. Nick spent most of the year programming for Apple. He started in March, and has already played a significant role (lead coder) in redoing the inventory management system for Apple stores nationwide. He is earning (after adjustment for inflation) close to what I earned after graduating law school. Eek! This does prompt questions about the value of secondary education. Nick has even had the good fortune to find an appreciative boss who looks after him. In short, he has a great job. Why it’s great to live in a forest. We had a bird feeder at home during the early summer, and it was a raging success. Before we abandoned the idea, because of the rabbits and other creatures who moved into the garden, encouraged by the grains the birds dropped on the ground, we were happy to indulge in a little amateur ornithology. The woodpeckers lived in an old tree on the property, since fallen in a storm, and found the feeder lots easier than the bugs in their tree. 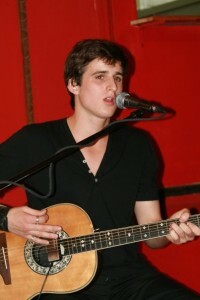 Tom at his first concert at La Mer Veuilleuse: found this one on FaceBook. From Santa Cruz to Paris and the Isle of Wight. . . . Tom spent the entire year living with his mum in Paris and studying at music school. He works as a teacher’s aide to supplement his income from playing guitar. On August 8 (8/8/09), he played his first concert, a solo that brought him about 90 Euros, over $100! 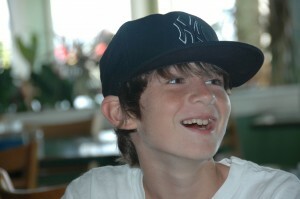 He has taken the stage name “Thomas Arlo,” his christian names, and has a fan page on Facebook if anyone’s interested. We miss the sounds of his guitar strumming away (a little less during the night than during the day! ), playing his favorite songs. If ever he feels very far away, and that happens a fair bit, I put on “A Time for Heroes,” from the Libertines, and it is as if he is right back with us! 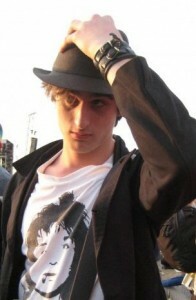 At the Isle of Wight, with his Pete Doherty t-shirt. Pete was lead singer for the Libertines. Fortunately, he was pretty good about keeping FaceBook and us (in that order!) posted with photographs and updates on his life, not forgetting videos of himself playing and singing, very well on both counts, and lyrics of the songs he writes. We use some of those FaceBook photos here, and I have a couple of his songs on my iPhone! Here is Tom at the Isle of Wight Festival. He feels closer than he is because of our high-tech contacts with him, but we still needed his month-long visit in September. It was his first visit in 20 months. Needless to say, it sure was good to see him! A bit of a relief too, because at his age (he turned 20 this year), things can change quickly and it is difficult not to worry, even though he is living with his mother in Paris. As it turned out, no worries. Alban continues his focus on local Santa Cruz culture. A collection of skateboards was lined up on a coffee table in his room. Upon closer review, the skateboards turned out to actually be the coffee table, a do-it-yourself affair that he had made by screwing the boards onto a frame. Charlie said “cool,” and immediately asked for the table to be moved to his room. Alban arriving in Paris to visit his father and French family: psyched!! Having visited his dad in Paris with Daphné during the summer, Alban is now talking about going to live with him in the New Year. Being 100% fluently bilingual (with no accent in either language and we are NOT jealous! ), he thinks that he can find a better job there. Any job is better than none, Alban! But, again, you’re only young once, and he assures us that he’s having a great time. Love this one! Alex in a relaxed moment during Alban’s birthday brunch at the Ideal Cafe. 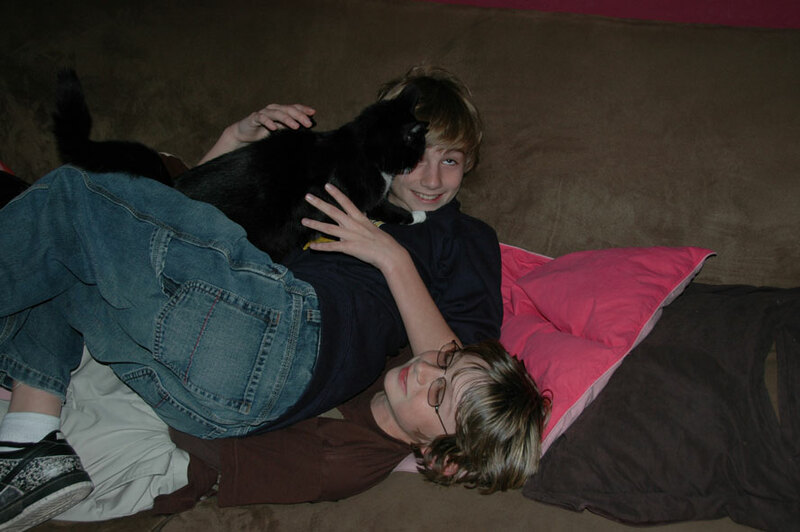 Charlie and Alex are spending one year together in middle school, Charlie in eighth grade, his last year there, and Alex in sixth, his first. They’d just spent two school years apart, with Alex still at Happy Valley School. Being back together was obviously a hit with each of them, discretely of course! At 14, Charlie is picking up some of those adolescent traits that we learned to treasure in his older siblings, and at 11 Alex takes great pleasure in emulating his big brother. No more little children in our house! A well-merited moment of shared delight! 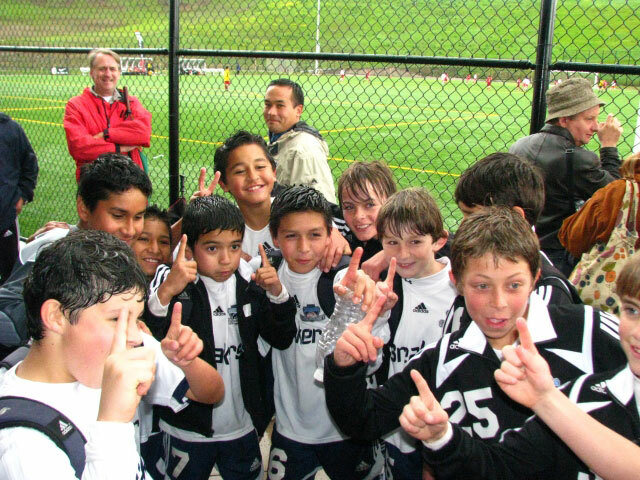 The boys had just won the State Cup final 2-1, having come back after being a goal down. They were telling each other, with some justification, that they were number one. Alex is looking this way, behind number 25. Their coach Mark (in the middle), Russ Hanlon and I are in the background, enjoying the feeling with them. 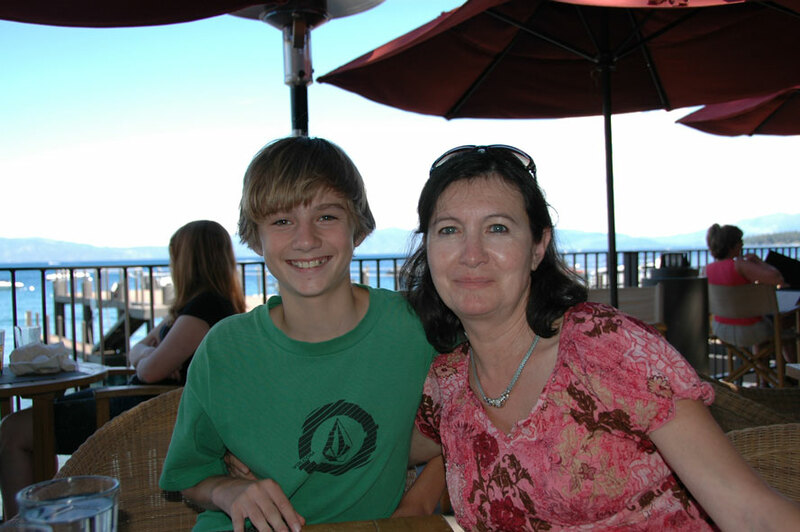 Charlie had a lot of fun playing soccer for his school team, and is now taller than his mother. Alex got straight As, including 2 A+s, during his first semester at middle school, and has moved from the violin to the mandolin (same finger placement) to the guitar. We have two guitarists in the family: YES! Next comes the triumph of the year, and it was Alex’s. 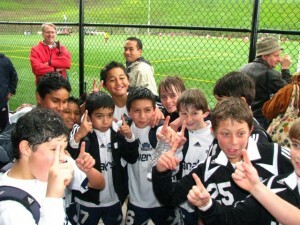 His soccer team played very well at the beginning of the year, well enough to win the Nor Cal State Cup for the first time. The year before, the same team made it to about the quarter finals, but this was their year! Events are not at all necessary for some of us to have fun! Charlie and Alex were roughhousing in the living room at home in January. This happens very regularly. The only unusual part of this particular occasion was that Snip joined in. She normally has much better instincts for self-preservation! The main soccer season for children here is in the fall and ends in November before Thanksgiving. State Cup is a tournament that starts during the season and then continues from weekend to weekend until the team is eliminated or makes the final. Here is a page of more sports from 2009. It features soccer, of course, including Surf Cup in San Diego, an elite tournament which Alex’s team qualified for by winning State Cup. It also covers other sports we were involved in during the year. One of the consequences of our older children’s increasing independence is that we parents do more with Alex and Charlie as a foursome. There’s the soccer, of course, and errands on the weekends, but also the occasional vacation or other trip. 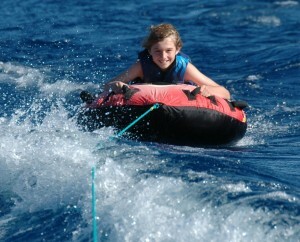 Charlie blastering on Lake Tahoe. Was that fun or what!? For those of you who don’t know, as we didn’t until the boys were doing it, blastering is riding on an inner tube towed behind a motor boat. The four of us spent a weekend visiting Tahoe and the Sierra Nevada, thanks to Debra and Tony. They invited Alex for a long weekend, and the other three of us showed up in the middle of it for a quick visit! No shame! Tony took us all out for an afternoon’s cruise on the Lake, and his, our and other children visiting (a very hospitable family!) spent a fabulous couple of hours jumping off boulders into the water and blastering. Blastering? See photo. 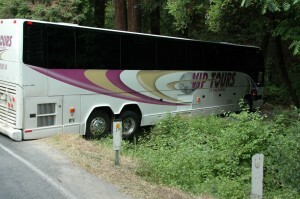 A tour bus on its way to the Mystery Spot, with its rear wheels not quite grounded! This bus with its wheels in the ditch offered us a little distraction. It is perhaps not easy to see, but the rear of the bus is resting on the shoulder of the road and the wheels are hanging in the air over our creek, which flows under the road there, when it flows, that is. 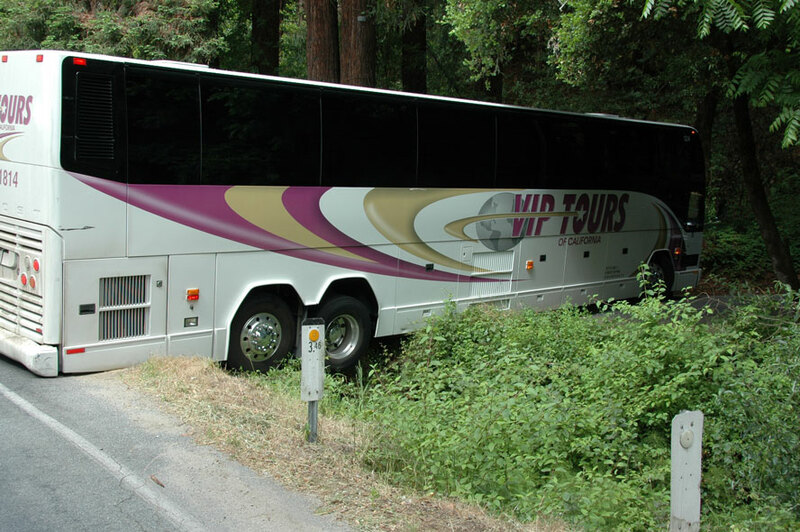 The bus was turning toward the Mystery Spot, and didn’t quite make it. It took the tow truck quite a while to pull it back on the tarmac. 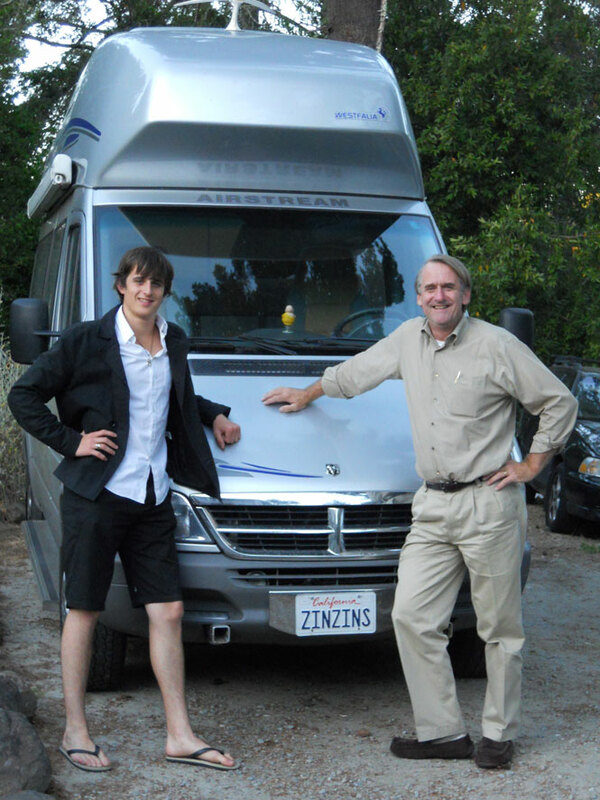 Here are Tom and I posing in front of this high but surprisingly not top-heavy RV. It drove like a dream! I drove Tom and Maureen in Cookie to Santa Barbara one weekend during their visit, with a stop in Big Sur, and to Yosemite for another. 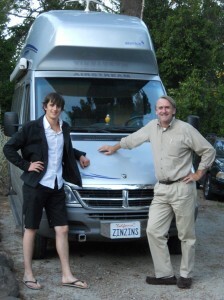 They had a great time, and instinctively took to RV life. There is a large skylight above the upper double bed, and the next morning both Tom and Maureen raved about the stars that they watched for hours as Ian slept below. Next, a serious group shot! A passer by took this shot at El Palomar in Santa Cruz on the night before Maureen left to return to Paris. He did a great job. From the left going around the table: Ian, Marie-Hélène, Charles, Alban, Tom, Maureen (Tom’s then girlfriend), Daniel, Nick and Alex. Daphné spent almost all of 2009 living and working in San Francisco, and couldn’t make this dinner. Hey, seven out of eight of us ain’t bad! Charlie with his maman in the restaurant on Lake Tahoe’s northwest shore where we lunched during our weekend away. I recently took my shirt off while hanging Christmas decorations: all that stretching and tacking was hard work! She reminded me that when Queen Victoria visited Egypt to inspect newly-discovered pharaoh’s tombs, Egypt being one of the hottest countries in the world, the explorer who had made the discovery asked his Queen for permission to remove his jacket. Her Majesty refused. 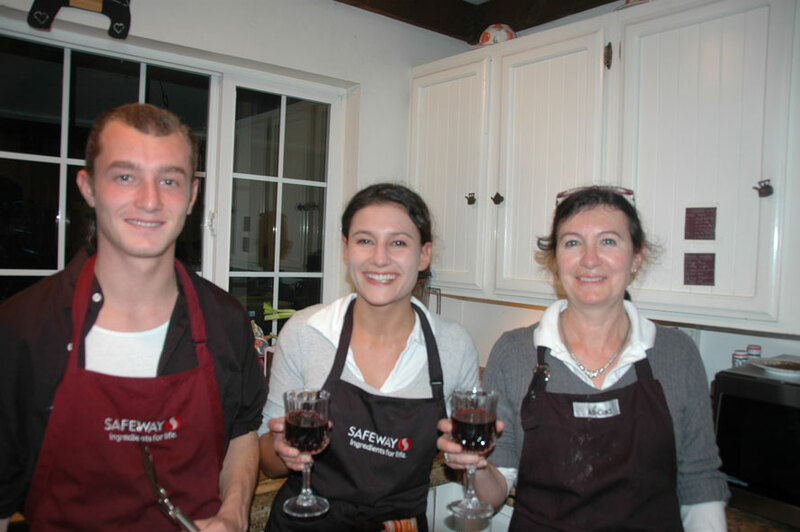 Our happy cooks for Thanksgiving, in the kitchen at B40. That was it for the wife and mother for this year’s update, which in itself may have foreshadowed our separation three months later. It had not been a good year for the couple. 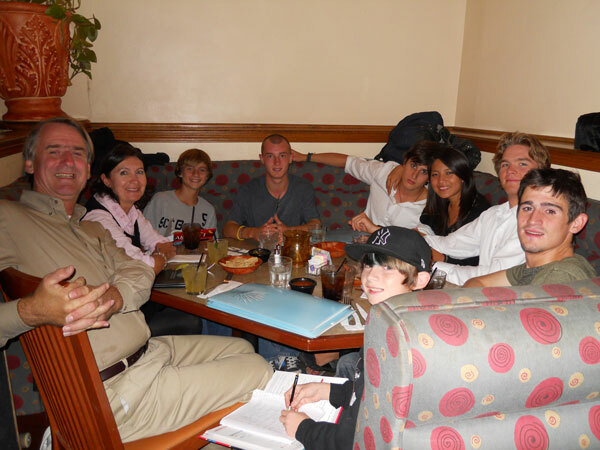 But as you can see from this journal, there were still many good things going on with and in the family. That never changed. 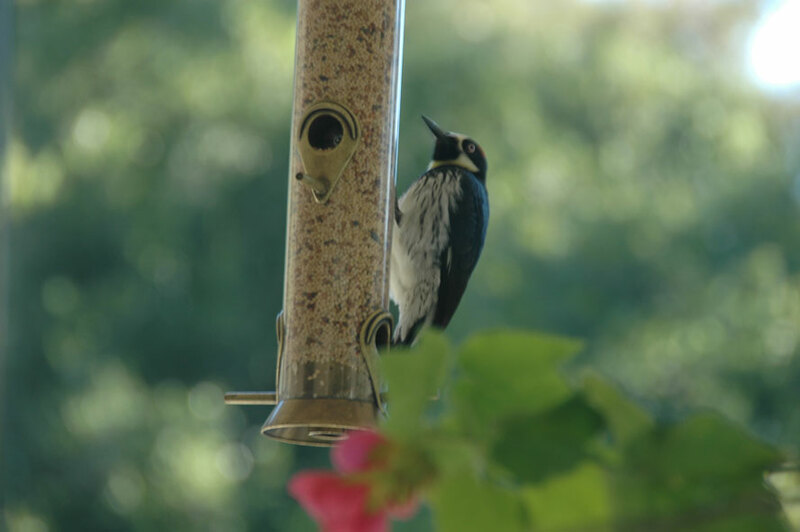 At one point during the summer, after Charlie had been out on his first visible date, his father decided that it was time to raise the age-old question of the birds and the bees. During an evening visit to Charlie’s room, I ventured delicately, in the middle of an unrelated conversation, that perhaps Charlie might be interested in a little advice or counsel on the subject of “dating.” That’s a wonderful word for bringing up the birds and the bees without embarrassment: dating. The presents awaiting their children on Christmas morning. Our sixteenth and last Christmas as a family. Right, good, yes, “people,” and off strolled dad. One needs to know one’s place in this world! As we do, each year when we look back and share our little anecdotes. Our place is a very thankful place, surrounded by so many blessings. May you share our good fortune this Holiday Season and in the New Year!